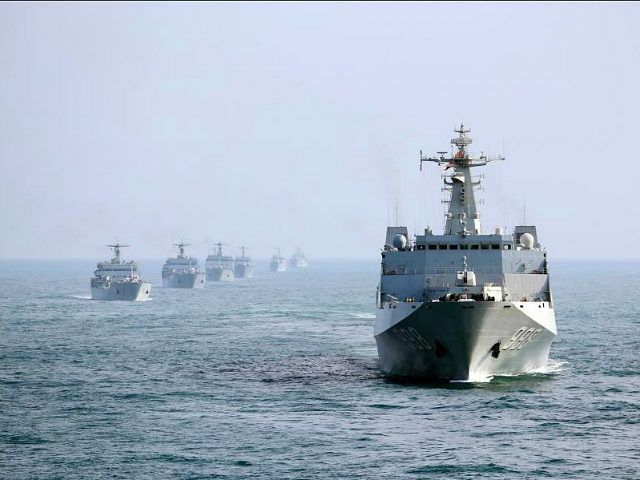 China’s People’s Liberation Army (PLA) has greatly increased its presence in the Taiwan Strait, part of the greater South China Sea, in response to the growing number of freedom of navigation operations (FONOPs) by the U.S. Navy, the South China Morning Post reported on Monday. The Post confirmed the news with the Taiwanese Defense Ministry, which operates independently of Beijing. While Taiwan is a sovereign nation with a fully functional federal government, the Chinese Communist Party regards it as a rogue province whose government requires submission to Beijing. A Taiwanese source told the Hong Kong-based newspaper that China’s military has increased “irregular” operations in the Taiwan straight and mirrored American activity in the region. “Each time the U.S. sent warships through the Taiwan Strait, the PLA has also dispatched its fleets to track the U.S.’ movements,” the source reportedly said. Last week, the Chinese government issued yet another protest regarding the U.S. Navy’s presence in the region. The United States runs routine FONOPs in the international waters of the South China Sea, which is legal under international maritime law. The objective of these exercises is to prevent the Chinese communist regime from claiming those waters as sovereign Chinese territory. China claims most of the South China Sea, including all of Taiwan’s sovereign territory and waters belonging to Vietnam, the Philippines, Brunei, Malaysia, and Indonesia. Despite an international court at the Hague ruling China’s claims the area illegal in 2016, China has continued taking possession of reefs and other structures, particularly in Vietnamese and Philippine territory, for military and civilian use. Without the American FONOPs, if China succeeds in intimidating all non-Chinese vessels out of international waters, it may successfully argue that it has possessed those waters over time. On Friday, the Chinese military confirmed that it had identified two American ships sailing through the Taiwan Strait, a legal activity. “The PLA will remain vigilant and resolutely safeguard national sovereignty and territorial integrity,” Senior Colonel Ren Guoqiang said at a press conference about the passage, according to the state-run Chinese People’s Daily. Foreign Ministry Geng Shuang also complained on Friday of a different U.S. Navy passage, this time through Vietnam’s Paracel Islands, which do not legally belong to China. Many in Taiwan appear to disagree with China’s claims, particularly in its waters. In a column published on Tuesday local time, writer Cheng Tien-chu of the Taipei Times accuses China of flagrantly violating the “red lines” of international maritime diplomacy on a regular basis. “There is no question that China under [Communist Party leader] Xi [Jinping] is ready and dares to challenge US vessels’ presence in the free, international South China Sea,” Cheng writes, adding that the Communist Party “has never ruled Taiwan” and has no valid standing for its claims. Under current President Tsai Ing-wen, Taiwan has asserted itself more aggressively on the international stage, urging the world to reward Taiwan’s democracy with support against China’s belligerence.